Renowned Cleveland-based artist DEREK HESS has been recognized for his poster work with bands such as Pantera, Pink Floyd and Pearl Jam, as well as being featured brands like MTV, Vh1 and TLC. Hess’ art has been featured everywhere from the Rock and Roll Hall of Fame to the infamous Louvre in Paris. While these accomplishments are celebrated by the outside world, many don’t know that there’s a bit more going on with DEREK HESS than often meets the eye. 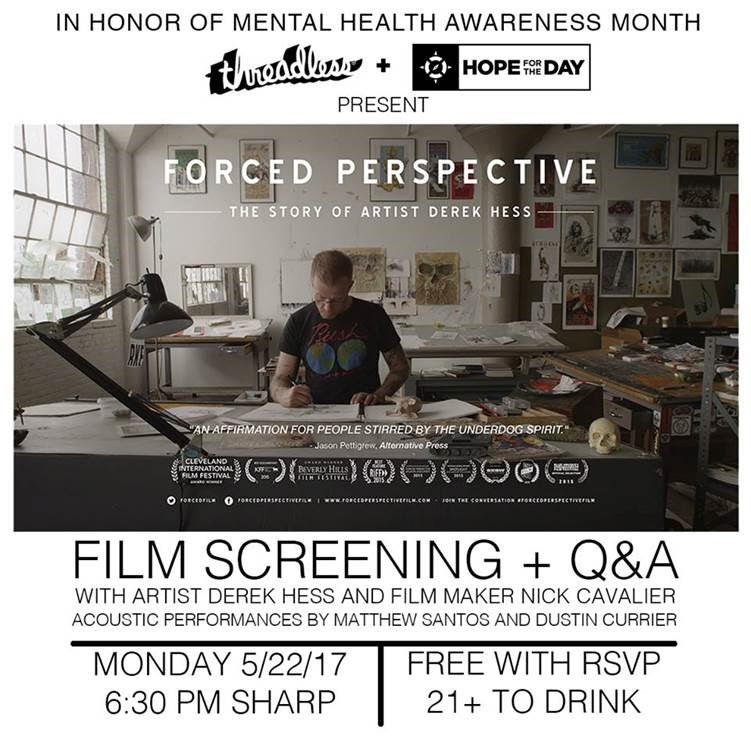 DEREK HESS has been public about his struggle with alcoholism and bipolar disorder, even releasing an intimate autobiographical documentary, Forced Perspective (2016), which has already won awards at the Cleveland International Film Festival, the Beverly Hills Film Festival and many others. Forced Perspective showcases the evolution of a renowned artist and his effect on music and culture while highlighting the link between creativity and mental illness. In acknowledgment of Mental Health Awareness Month, DEREK HESS is taking part in several activities to raise awareness for the cause. Hess has teamed up with e-commerce company Threadless to create a t-shirt to benefit Hope For The Day, a global non-profit organization achieving proactive suicide prevention by providing outreach and mental health education through self-expression platforms. 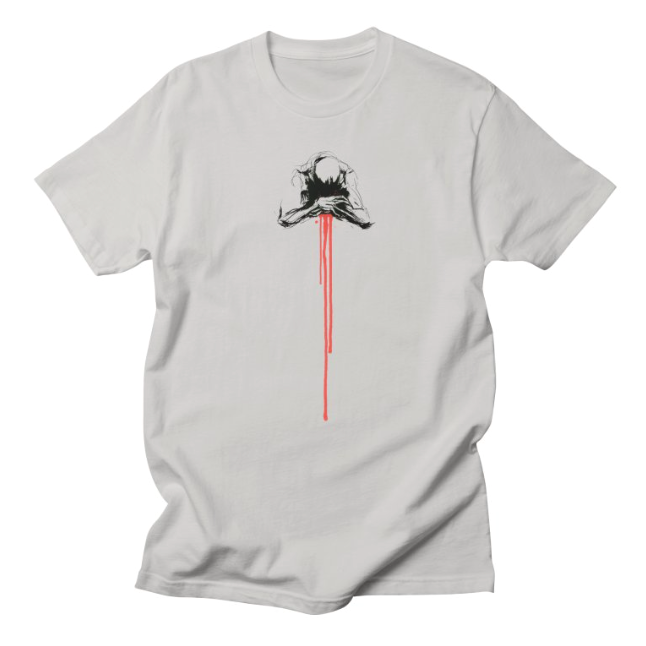 See above for the design, “Hemorrhage”, which is available on shirts and triblends in a variety of colors only during the month of May. All proceeds will go to Hope For The Day and with each purchase of the t-shirt, you will get access to the Forced Perspective documentary. You can find the design at https://hopefortheday.threadless.com/. Threadless will also be hosting a viewing of Forced Perspective at their HQ in Chicago, IL on May 22 at 6:30pm. The viewing will have live performances from Dustin Currier and Matthew Santos as well as a Q&A with Derek and filmmaker Nick Cavalier. “Myself and many of us at Threadless and our community have family/friends who struggle with mental health issues. We are proud to support an organization working hard to help others deal with these issues and show they are not alone,” says Lance Curran, Artist Shops Account Director for Threadless. “It is an honor to work with Derek and Threadless on this project during Mental Health Month. It is truly amazing to see the impact we can make and what we can accomplish as a community that refuses to stay silent about mental health,” adds Jonny Boucher, Founder & CEO of Hope for the Day. In addition to helping raise funds for Hope For The Day, every day this month, DEREK HESS has been posting and describing an image of his that depicts his struggle with bipolar and dual diagnosis on both Facebook and Instagram. Each year millions of Americans face the reality of living with a mental health condition. One in five Americans will be affected by a mental health condition in their lifetime and every American is affected or impacted through their friends and family. Take action today to help others as we fight stigma, provide support, educate the public and advocate for equal care. Throughout May, Hope for the Day and participants across the country are raising awareness for the importance of mental health. Each year we fight stigma, provide support, educate the public and advocate for equal care. Each year, the movement grows stronger. DEREK HESS‘ documentary, Forced Perspective, is available for purchase via IndieMerch in DVD and BluRay formats, as well as for download and streaming On Demand via Vimeo, Amazon, iTunes and Google Play. IndieMerch has several physical packages available, including signed limited edition posters, a 125-page Forced Perspectivecompanion book, limited edition silk-screen prints, and more. In addition to the full-length film, the DVD/BluRay includes deleted scenes, a film premiere Q&A, behind-the-scenes footage, teaser vignettes, trailers, and more.